Let our Wise Old Owl find it for you! Next Day Delivery £6.50. Free delivery for orders over £50. A beautiful festive owl Christmas card. Brand new to our range for 2014, this lovely card has been designed exclusively for The Little Blue Owl. The cheerful design appeals to both adults and children alike. The card has been left blank on the inside for your own festive message. 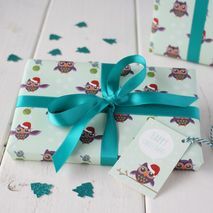 Matching gift wrap also available, please visit our storefront for further information. Also available in Festive Fox and Snowy Hedgehog designs. All of our cards made in the UK from high quality 300 gsm card. Show your inbox some love! special offers, new product ranges and much more! © The Little Blue Owl Ltd 2019. All rights reserved.